Axialis CursorWorkshop permits to modify cursors directly in program files like EXE, DLL, OCX. This feature is handy to customize existing applications. This will also permit you to extract cursors embedded in applications. 1. Choose File/Open and select a program file EXE, DLL, OCX... You can also open an Browser window (Ctrl+Alt+O) and double click on a program file. 3. To modify a cursor just double click on it or select it and press Enter. 4. The cursor opens in an editor window. Just modify it as if it was a standard cursor file. 6. The cursor has been updated in the list (if you modified the displayed format). 7. Repeat steps 3 to 7 for other cursors if necessary. 2. 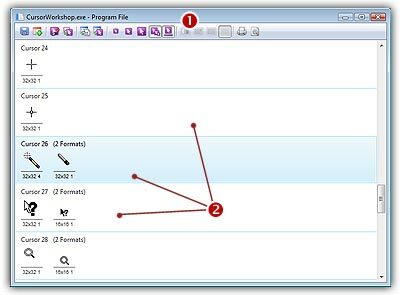 The program opens in a document window displaying all the cursors it contains. 3. Select the cursors you wish to extract. 6. The cursors are extracted as CUR or ANI (depending on their types). 3. Select the cursors you wish to add to the librarian. Choose File/Add to the Librarian or press F3. 4. A dialog box opens. Choose either to extract them as separate cursors (CUR/ANI) or to create a cursor library (CUL). 5. Click OK. The cursors are extracted as requested. 4. The cursors are immediately added to the selected library.